The grouping was born from art student colleagues at the La Esmeralda art school in Mexico City and was originally formed around a project called Grupo (DE). Currently, Cooperativa Cráter Invertido is made up of various collective and shared efforts including an online journal, an advococy group that deals with environmental issues, an informal publishing house and other efforts as well. Diego Teo, one of its members says, "We’re really not a fixed group with a set membership in which everybody takes part when we’re invited to do something or the group falls apart if one member leaves. We share affinities, which is why we’re a Cooperative of Collectives." The group states that their formation and current interests lie in the intersections between art and other areas of work, such as politics. In their words, they are interested in "channels that aren’t interested in the art world, but focus more on creating awareness of public and political issues using art-based or graphic means." 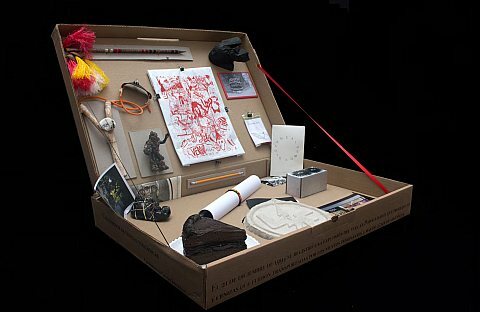 They finance themselves through the sale of a box of multiples comprised of art objects made by each of its members. Cráter Invertido consists of Yollotl Alvarado, Juan Caloca, Dasha Chernysheva, Maik Dally, Victor del Moral, Wayzatta Fernández, Rodrigo Frenk, Natalia Magdaleno, Jazael Olguín Zapata, Diego Teo, Erik Tlaseca, Rodrigo Treviño, Andrés Villalobos and Nicolás Wills. In this interview, curator Raquel de Anda speaks with Juan Calaca, Natalia Magdaleno, Diego Teo and Andrés Villalobos about the group’s history and the multidisciplinary way they approach their collective project.